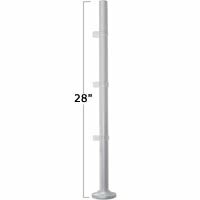 Pole Height: 28". Pole Diameter: 1-1/8". 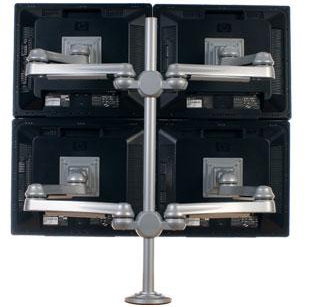 MA-4-C - Quad flat panel monitor arm holds four monitors. Extended height pole mount with height adjustable arms. Long length arms. Each arm has five articulation points. 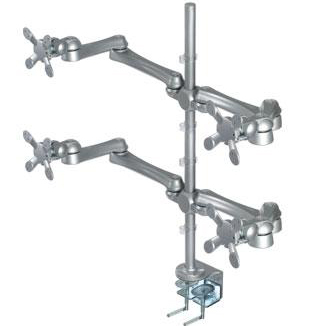 Pole mount monitor arm for four monitors. Fits up to 27" diagonal monitors. Height adjustable on the pole using supplied Allen key. Quick connect 75/100 mm VESA mounts. Cable organizers under arms and on pole. Superior adjustability for healthy computing. Share information for better collaboration. Increase productivity with multiple monitors. 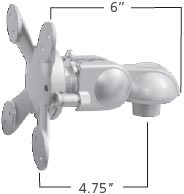 Arms made from die cast aluminum alloy with 90% recycled material content (10% pre-consumer and 80% post-consumer). Mounts made from steel with 90% recycled material content (10% preconsumer and 80% post-consumer). 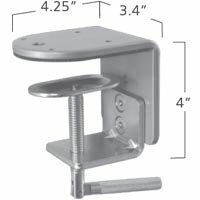 Quick connect mount provides speed and convenience when attaching or removing monitors. To attach a monitor, remove Quick connect mount from the arm, and mount it to the monitor using the screws provided. With the monitor attached, simply re-install the Quick connect mount on the arm. Quick connect mounts are interchangeable between MA5000 and MA2000 arms. Adapter plate for 200mm x100mm VESA hole pattern available. VESA mount rotates 270º for portrait or landscape monitor viewing. Standard Clamp (MA2000-201B), Large Clamp (MA2000-901AA) and Deep Clamp (C1). 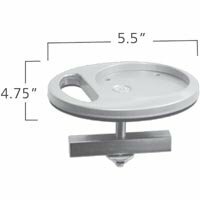 Standard clamp mount fits surfaces up to 2.75" thick. 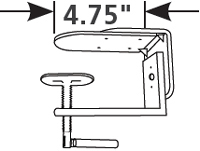 Clamp is two-piece, front-fastening to simplify installation in an existing workstation (requires 1/4" clearance between desk and panel or wall for surfaces up to 1.5" thick, 1/2" clearance for surfaces 1.5"-2.75"). Turn-handle allows clamp repositioning without tools. Large clamp is used on models using Large (28") Pole. Deep clamp C1 designed for radius underside surfaces. Grommet mount fits surfaces up to 1.5” thick. Fastens together using bolt and 3.75” long clamping bar. Grommet base will cover hole up to 2.5” diameter. Mounts to Large Clamp or Grommet. 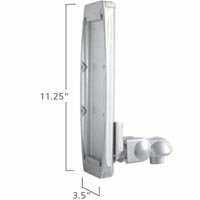 Poles include decorative base cover, pole clips, pole cap Extensions include one set of connecting hardware with cable manager. Use when mounting two monitors. Height adjustable using supplied Allen key. Attach to connector or use use with another extension. Maximum two extensions per arm. Quick connect 75/100 mm VESA mount. Attach VESA mount to extension or to connector. Mounts between the monitor and the arm. Accommodates monitor weight of 8.8 lbs - 13.2 lbs. Mounts on MA2000 monitor arms only. Maxi Load Capacity per Arm Using Two Extensions = 17.5 lbs. Using One Extension = 22 lbs. Using VESA Mount only = 26 lbs.